Car Photo of the Day: I still love this car. OK, not the best of photographs, as the background is way too busy, but I have to admit I still like this shot. 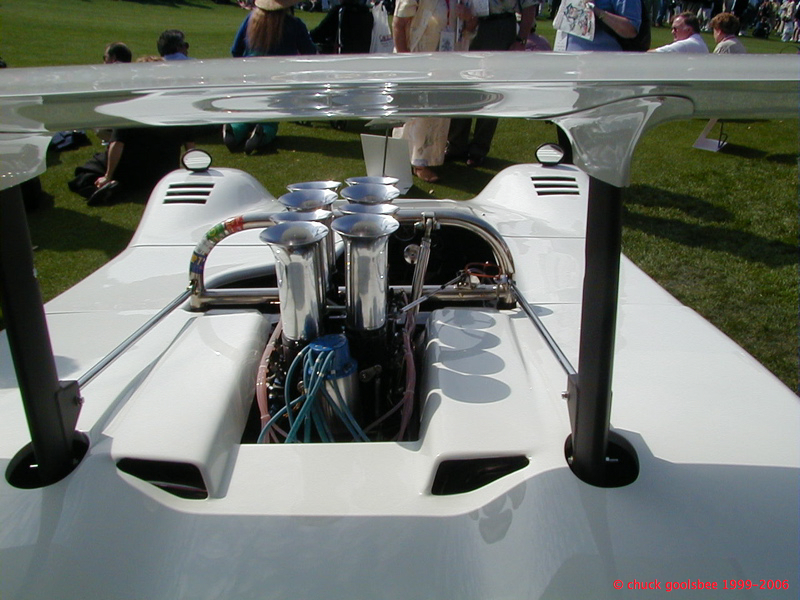 Perhaps it is my life-long lust for Jim Hall’s Chaparral Can-Am cars. I saw them in the flesh, being driven in anger at Road America in Elkhart Lake, Wisconsin when I was a small boy. While Hall was a perennial 3rd place to the McLarens and their Kiwi drivers (as Jerome will no doubt remind us in the comments) the SBC-powered winged white little Texas cars were my heros. Every year something radical and new. To stumble upon this blast from my past at the Amelia Island Concours was a real treat. I spent easily 30+ minutes staring at it from every angle. I even touched it now and then. I’m sure other people there thought I was some oddball stalker… no… I was just seeing an old and admired friend. Oh, and the sound…I too, was witness to these beasts racing in my callow ‘yout.’ I’m no fan of big honkin’ ‘Murrican V8s, but the sound of these –monsters– running down the front straight of CDR is now, and will forever be etched into my limbic brain! Dad drove Tweety in a race in 1968 (he needed to finish one more race that year to keep his Nat’l SCCA license, and the Cooper Formula Jr. was busted) and the S.O. M (Stewards Of the Meet, or “Silly Old Men”) stuck the Jag in the run group that had the Can Am cars in it. [www.imca-slotracing.com/images/riverside-nr4.jpg] and Hall’s Chaparral just *blew* by the old man, bracketing the Jaguar –and its song could *no longer* be heard. They went by at *just shy* of 200 MPH…!!!! didn’t know those E-type’s could sound like a lawn mower!! LOL!! When bracketed by two HIGHLY-Modified 350 cu. in. V-8s (each making about 500 HP), turning around 6500 RPM, with their big ‘blooey pipe’ exhausts, then *anything* pretty much sounds like a lawnmower! I’m pretty sure this is the McLaren M12 run by Chaparral when their car wasn’t ready. Wrong injectors, no side radiators, struts from wing to roll bar, etc. Previous Previous post: Car Photo of the Day: A green race car on the green.